An important figure in the civil wars of the mid 16th century, Uesugi no Terutora was born to the ruling family of the province of Echigo in 1530. At the age of 13 he seized power by ousting his sickly brother. In 1552, as feudal lords often did, he became a priest and changed his name to Kenshin. He is shown here resting at camp under the full moon before a battle against his rival, the ambitious leader Takeda Shingen. 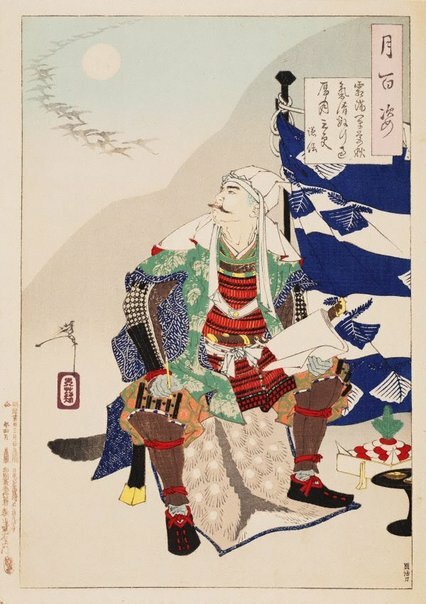 He sits on a stool wearing his priestly headdress rather than a helmet, and is inspired by the geese flying in the moonlight to write a poem; the reference to the third hour in the poem signifies midnight.